Was looking at the cabinet where I place my spray paints and was surprised at the amount of inventory I already had. And thats for just 2 model kits built! 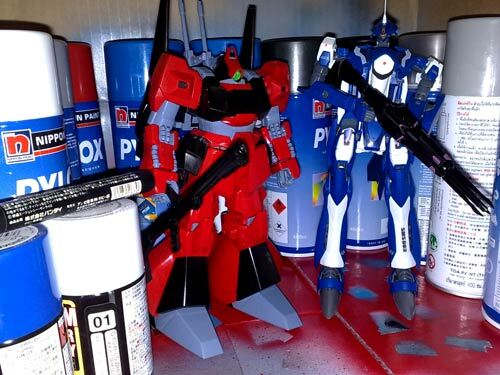 The large cans are Pylox Lacquer Spray paints from Nippon Paint while the two smaller cans are Gundam Spray paints from GSI Creos. Then there is the lone Gundam Marker. 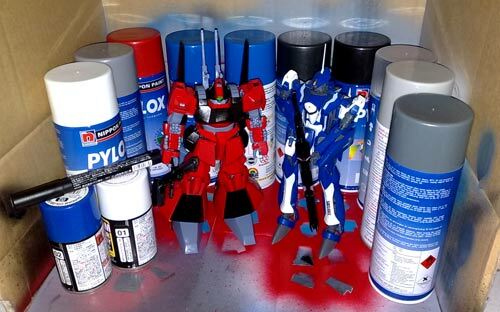 The Pylox can contains about 400 ml of paint while the Gundam spray paints have about 100ml. 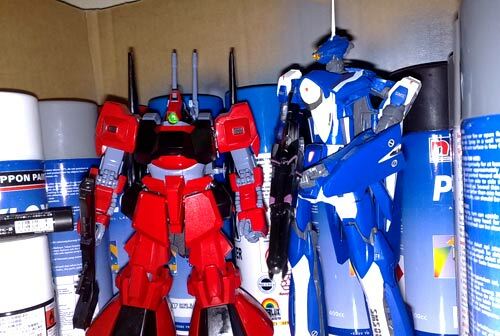 The Gundam Blue (small can) was used to paint all the blue parts of the 1/72 VF-25G Messiah. The can is mostly used up already and I doubt it would be able to cover 1/4 of a regular sized Gundam MG model. I was surprised that that small can was able to cover all the blue parts. Compare that with the Fire Red Pylox, which was used to color the red parts of the Rick Dias. Judging from its weight I'd assume that 3/4 had already been consumed. I'm assuming that the consumption rate is faster because of the pressure of the Pylox can, which is stronger than the smaller Gundam Spray paint, hence the greater wastage. The two large blue and dark grey Pylox cans were bought in anticipation of the Gundam 00 Exia that I had bought recently. Two blue cans because one of the cans had a color that didn't match its color chart, instead of the Oxford blue color it was touted to be, what came out was a shade of light blue. Good thing I always do a test spray in the spray booth before spraying on an actual model part, otherwise it would have been disaster. The plastic primer spray was bought in hopes of solving the stripping problem that was occuring with the Pylox Fire Red.